Looking back, it was around 2005 when my love affair with capsaicin began. During this time I could be found wearing mandarin collars and stunning imported silks, mainly because I was a server in one of my best friend’s family owned restaurants. Sukhothai started it all. Ever since, I’m always on the lookout for new ways to heat things up in the kitchen… and in the garden! For the past 3 years I’ve grown Chinese Five Color peppers and this year will be no different. Not only do these little babies pack a serious heat-punch, they also add a burst of vibrant color anywhere that needs a little livening up! Last fall, I made the strategic decision to head over the river and through the woods and set up camp in my old stomping grounds… but not without first harvesting all my remaining produce still growing about the property! With several quart boxes in tow, I was now faced with the challenge of preserving these bright beauties to be savored during the cold winter months. In years past I’ve both frozen and dehydrated them, but never have I pickled them! Wash peppers thoroughly. Remove core, seeds, and stems of large peppers and coin; small peppers can be processed whole with stems intact. Make 2 small slits in whole peppers. Mix vinegar and water; heat to boiling. Be careful to not boil your vinegar too long as it is rather volatile. 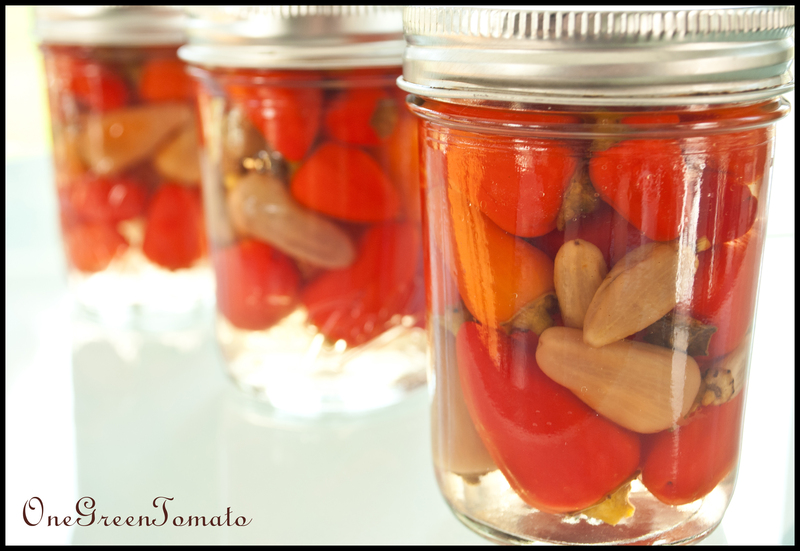 Tightly pack peppers into sterile, hot jars and pour the vinegar-water on top, leaving 3/4″ headspace. Add 1/4″ olive oil and a pinch of salt, if desired. Wipe rims, add two-piece adjustable lids and process in a boiling-water bath for 15 minutes. Remove jars from canner and place on a wire rack for 12-24 hours, undisturbed, so seals may properly set. How do you use pickled peppers? We always have way to many at the end of the season, Chinese 5 included. Hi Melissa, I like to slice them to use as a pizza topping or toss them into a veggie stir-fry. They’re also really good right out of the jar! 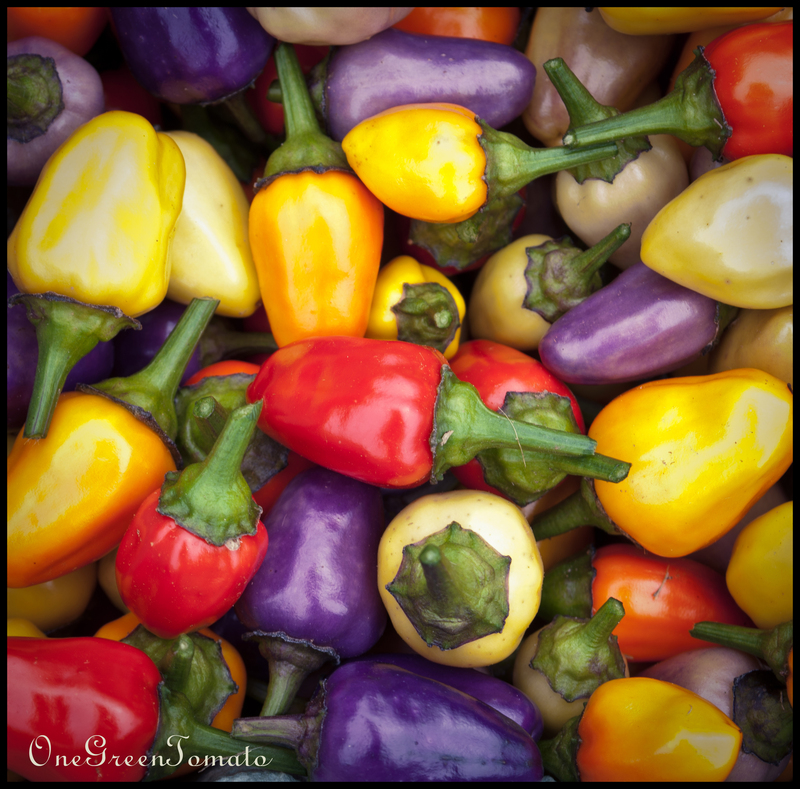 The picture of your peppers is one of the most beautiful I have seen on a blog – great job! I also like the canned peppers! Thank you so much for your kind words about my photography! You are welcome and I truly mean that – you should go over to http://foodstoriesblog.com/ C.J. Runs that site and it wonderful – you have to enter that picture into her weekly food photo contest – I bet you would win. I would vote for you and she pays cash to the winner! I made pickled jalapenos for the first time this year and feel in love! I bet I’d love these too! Steph, I bet you will too!!! Thank you so much for the heads up on the NuMex Twilight! I’ll definitely check them out!